Yoga is een kunst, een wetenschap en een filosofie. Yoga beroert de mens in zijn verschillende lagen: fysisch, mentaal en spiritueel. Yoga is een praktische methode om het leven zinvol, nuttig en edel te vervolmaken. Yoga enables one’s body, organs of actions, senses of perception, mind, intelligence, consciousness as well as trillions of cells to get attuned to its essence – the conscious seer within. 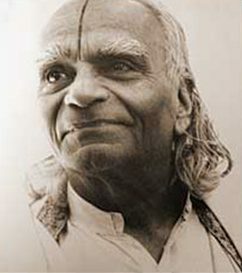 Yoga alone enables the seer to directly perceive and experience using his vestments for the world within and around himself to gain insight and feel the divine joy of all creation. The Yogi then shares the Amrta, the nectar of divine wealth and happiness with his fellow beings. We begin to do Yoga with a motive. That motive may be for health or for making a career or for enjoyment of worldly pleasure or for emancipation. It is only after we continue practising Yoga that it dawns on us that we do not do Yoga for health, or for enjoyment or for emancipation. Then, why do we do Yoga? Patanjali explains that mind, intelligence, consciousness and the very core of our being get involved with thought waves making us forget for that moment their true element of nature. This conjunction of mind, intelligence and consciousness with thoughts of objects seen, perceived or conceived creates desire. These desires make one to act once without using the discriminative faculty and one becomes a victim of his own thoughts and deeds. Uninterrupted practice of Yoga done with devotion keeps the practitioner free from motivation, desire and reward and he develops discriminative intelligence. This discriminative intelligence which develops in the practitioner of Yoga keeps his mind free from contact of tempting objects and yokes it to the soul which is unmoving, unrotating but ever in the state of present. Yoking the mind, intelligence and consciousness to the soul or the Self is possible only through the yogic disciplines which keep the body firm, pure, mind stable and intelligence clear. Through reverential practice of Yoga, the fire which emanates from the practice burns out the impurities of body, mind and intelligence and bestows the consciousness with the crown of wisdom for it rests on the lap of the Self. From then on the never changing intuitive light of the Self radiates and frees the practitioner from the actions which are filled with afflictions. That’s why daily intensive practice is very important. There is no other way so that one can reach that state of emancipation that is free from the afflictions of sorrows.